As I write this, I know that I’m going to have to sit on this news for two weeks. TWO WEEKS. Don’t get me wrong, I deeply appreciate having time to prepare and to be ready for the formal announcement. I wrote a blog post about how to handle having secret good news, which I’m pretty sure fooled no one. My problem is that before I was a writer, I was a fan. Heck. I’m still a fan, it’s just that I also do this writing thing. So being nominated for a Hugo is like seeing my book on a library shelf. It feels… magic. 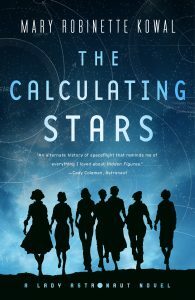 This particular Hugo nomination is especially delightful, because it is for Calculating Stars, which began life as The Lady Astronaut of Mars. To have created a character who has made it to the ballot twice? Y’all… I’m a writer and I’ve got no words. It’s killing me that, I don’t know who the other nominees are yet. Every year, I get excited to read new work and since I was a teen I would pick up books that were on the Hugo finalists list. I can’t wait to read this year’s selection. And all the other categories, too! Meanwhile, I have to sit on the news. I’ll shop for an evening gown. I’ll keep working on book three. I’ll try to ignore the fact that you have honored my novel with this nomination. Thank you. I’m so excited for you, Mary! It’s such a fabulous book and series. I’ve recommended it so many readers. I am so happy to see the book get the much-deserved recognition. 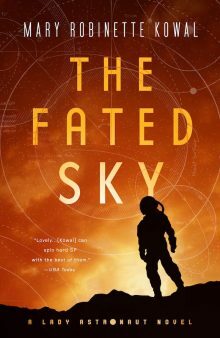 Congratulations, Mary Robinette! I’m so happy for you – it’s a great book! Congratulations! This nomination is well deserved!! I am not surprised in the slightest. 😀 Congrats! Congratulations! OK, now I’ll have to get this. I was introduced to your narration recently with Amberlough. Your narration is superb! I look forward to listening to you reading your own work.